Sales of houses listed on America’s Multiple Listing Services fell by 4.1% month to month and 5.4% year to year in April, based on the National Association of Realtor’s so called “Pending Home Sales Index.” These figures are different than those reported by the media because they are actual, not seasonally adjusted data (NSA). The “pending” sales are actually sales. Only the closing is pending. Around 90-95% of all such sales go to closing within a couple of months. The closing, when the keys change hand, is a formality. The signing of the contract is when everyone, including the buyer, the seller, the listing broker and the selling broker, as well as prospective buyers in the market consider the house sold. And rightly so. It’s when the price is established, the SOLD sign goes up and everyone starts making plans to move. 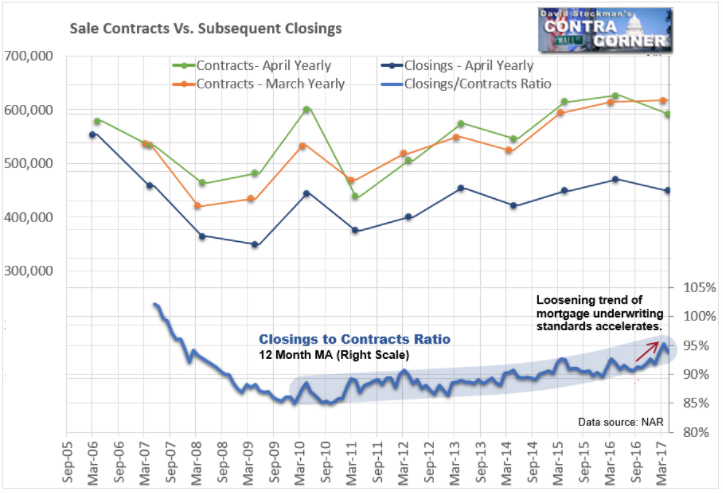 No one expects their sale or purchase to be among the 5-10% that don’t close. So the “Pending Home Sales Index” is the real story of the current state of the housing market. 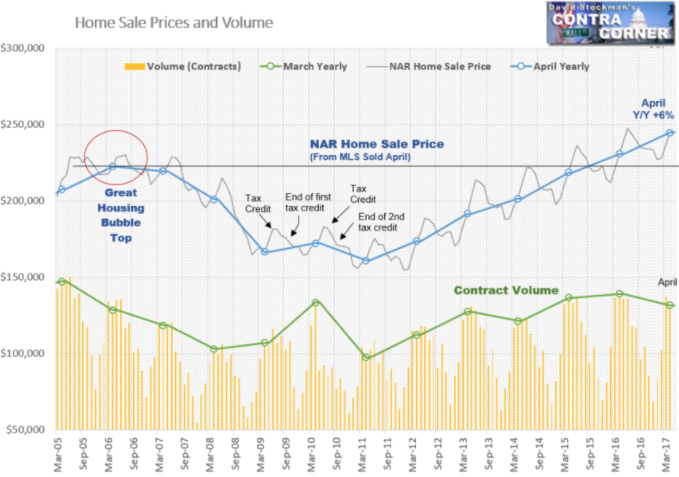 Combine it with the already reported prices from the same Multiple Listing Services for the same month, and we can build a pretty good chart of the nearly current state of the market. Contrast that with the idiotic methodology of the Case Shiller indexes which, when released, are effectively reporting the state of the market 5 1/2 months ago . Seeing the chart of the current market should give us pause. 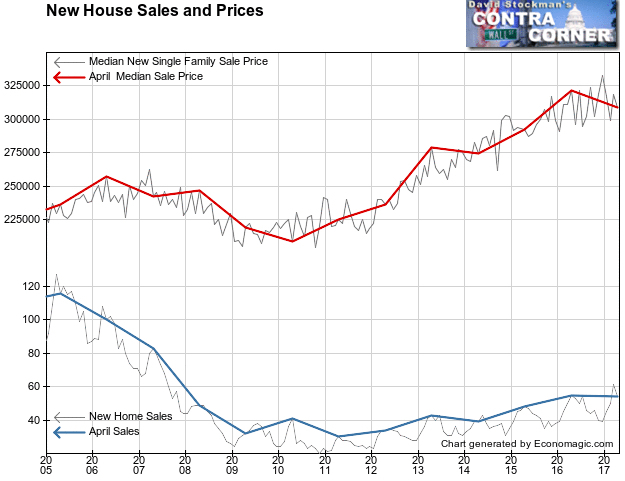 Unlike new home sales, prices of existing houses are still rising at the rate of 6% per year. But sales volume has weakened. And I don’t think this is a one and done. It will almost certainly get worse from here–maybe not immediately over the next month or two, but it’s coming. Prices have continued to rise and mortgage rates have stabilized after coming off all time lows last year. Without that subsidy from record low mortgage rates, fewer buyers can afford to buy a home. Builders, threatened by that, have already begun to cut new home prices. This may be just a warning shot, but the handwriting is on the wall. A change in trend is either under way or coming to a market near you soon. Mortgage rates are loosely tied to the yield on the 10 Year Treasury Note. Right now the Treasury market is benefitting from the reimposition of the debt ceiling. The Treasury is restricted from new borrowing. Therefore it is not adding much new supply to the market as usual. That takes the pressure off yields. That has allowed mortgage rates to hang around near 4%. That won’t be the gift that keeps on giving. Probably no later than early October, Congress will lift the debt ceiling and the Treasury will need to return to the market in a big way. We’ve seen this act before in the 2015 debt ceiling drama. When the ceiling was lifted then, the Treasury flooded the market with supply and yields surged for about a month in November. Just as in 2015, the Federal government will again need to initially repay hundreds of billions of dollars it borrowed from its internal accounts. The market will be flooded with supply for up to a month. Yields will surge. But there’s another issue. When normal borrowing resumes, the Fed will remain on the sidelines and is threatening to begin indirectly adding to supply by shrinking its balance sheet. When it redeems some of its Treasury holdings instead of rolling them over as usual, the Treasury must go into the market to raise the funds to redeem those notes and bonds. That adds to supply. So, first there will be the initial surge in bond yields from raising the funds to pay back the government pension funds and the like that it raided. Then normal supply will return, plus whatever the Fed adds by redeeming some of its holdings on a regular basis. A steady grind higher is likely to follow, taking mortgage rates along for the ride. It will be the kiss of death for the housing market. The current sales data shows that the slowdown has already begun. The April decline is unusual. Looking at the actual, NSA data, April is normally an up month. On average over the prior 10 years, sales have increased by 2.5% month to month in April. In April 2016 they were up by 1.9%. This year, April had a decline of 4.1%. On a year to year basis, sales had been running relatively flat, with an average year to year gain of 0.6% over the past 12 months. The current year to year drop of 5.4% is well outside the range of the past year. It suggests a change of trend. April’s sales were not only below last April’s, they were below April 2015 as well. That meant that lenders were loosening underwriting standards and appraisers were pushing values higher under pressure from lenders. That is what typically happens in the late stages of a localized or national housing bubble. When only 85-90% of sales close, that’s an indication of a market with conservative credit standards. It’s a good time to buy if you qualify. But when buyers, sellers and lenders go into panic mode, seemingly every piece of junk makes it to closing. 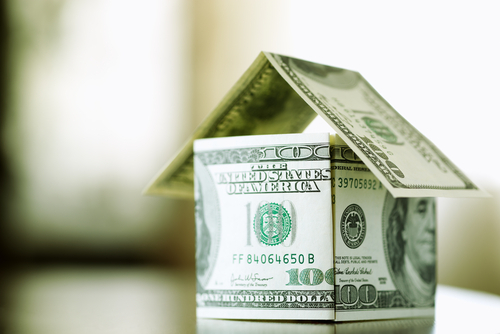 Mortgage underwriters are under pressure to make deals work. They let buyers sneak through who would not have qualified in the past. Their income qualifying ratios are allowed to stretch beyond customary limits. Their credit ratings are lower than normally acceptable. Appraisal values inflate. Sales are rushed to closing in short time windows. All in the name of beating rising house prices and the next mortgage rate increase. I worked in the trenches of the real estate, mortgage, and appraisal businesses for years. I have seen all of these things first hand in the past. When they happen, the end is nigh. Lee Adler is the publisher of The Wall Street Examiner. He also assisted in developing David Stockman’s Contra Corner, serving as associate publisher. Adler is a veteran financial market analyst who began his career on Wall Street in the 1970s, and has been the editor and publisher of several other financial opinion websites, since October of 2000.